Over the last week or so, I’ve been meeting with those who have volunteered to be participants in my study. Like me, they’re all first year, full-time PhD students who are women. I’ve been talking to them about what the study involves, which is an interview once a year throughout the PhD, keeping a research diary and writing a letter to their future self. Writing letters to future selves is an idea that people may have heard of in a slightly different form or a different context, for example where expectant parents have written a letter to their child at the age of 18. However, some people haven’t heard of it at all, and I wondered whether it might be something that participants would see as an additional, burdensome task that they had to complete on top of their own research. I explained that the letter should be addressed to their future self, at the point where they were about to finish their PhD. 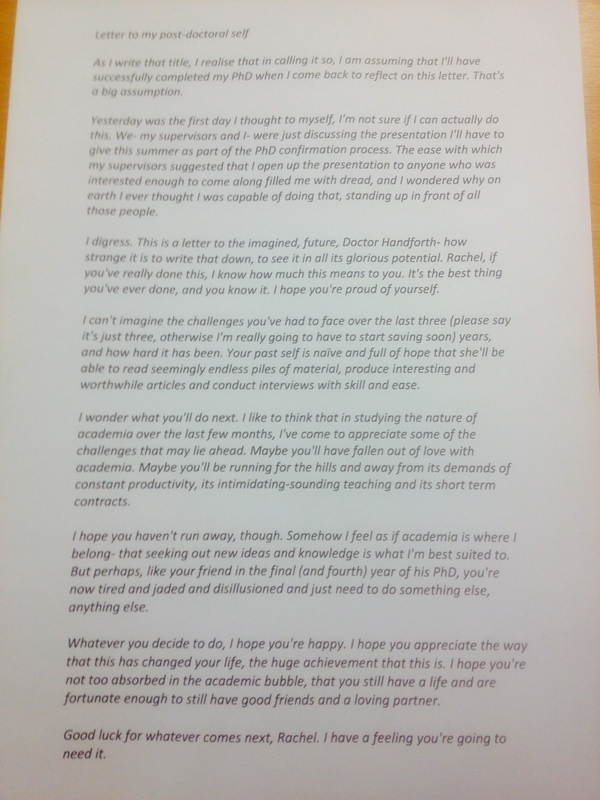 I asked them to consider how they thought they would be feeling about their PhD by 2017, what advice they might give themselves as came to the end of their PhD, and what their hopes for their future self were. Towards the end of the time when the participants and I should be completing our PhDs, we will also write a letter to our past selves. This will be an opportunity for us to reflect on our experiences over the past few years, and consider what we would have said to ourselves when we were starting the PhD. The reason I’m using this method is because I think it will be really interesting to gain insight into how the participants (and myself) currently imagine who they will be in three year’s time. This isn’t something that most of us would do- really imagine who that future self could be, what they might be like and what they might have achieved- let alone address them directly from our current point in time. Each letter is a snapshot, a moment where all the possibilities of who we could be are considered by who we are, now. These snapshots will be incredibly useful to me in writing about the changing career aspirations of female PhD students, particularly when the letters to future selves are combined with the letters to past selves, written towards the end of our time as PhD students. In talking to the participants about the letters, I was really pleased by the generally positive reaction to writing them. One person said that she would be really pleased to have these letters to keep for posterity. I hadn’t really thought about this until she said it- these letters will exist long after my research has ended. They are highly personal artefacts from our journeys through this incredibly formative part of our lives, and will attest to who we were and what we believed was possible. Though I found mine initially hard to write, I’d recommend doing this to anyone.